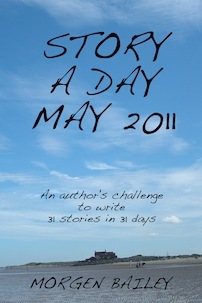 All three Story A Day May Collections are now available on Smashwords, Amazon.com and Amazon.co.uk (and other Amazon countries) for $0.99 / £0.77 – which works out at 5c/3p a story, details below. 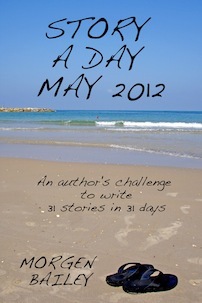 These collections comprise the 31 short stories and flash fiction written from daily prompts given during May 2011, May 2012 and May 2013. No prompt information, no author comments, just the stories themselves. Inspired by the Story A Day.org website. Over, A Military Couple (part one), Holding Her Hand, May The Fourth Be With You, Ghost, The Threadbare Girl (part one), Do It Right Or Get Off the Horse, Whatever You Say, Norman The Conqueror, Late, The Big Game, A Military Couple (part two – A Different Perspective), The Houseguest, A Story For Amelia Earhart, Alternate Reality, A Scientifically Unexplained Occurrence, Daphne The Tour Guide, A Broken Dart / Of Moonlight – Splintered On The Sea, Man Overboard, In The Stars, Court (A Shaggy Dog Story), The Case That Sherlock Couldn’t Crack, She Suspects, Sparkly Blue, Don’t, Into The Wild Blue Yonder, They Said It Couldn’t Be Done, Feeling Like A Child Again, Small Town Drama, The Lake At Dusk, and The Threadbare Girl (part two). Total word count = 20,096. You can read more about this collection (including review) here, and you can read the prompts which inspired this collection here. An English Summer (496 words), You Are A Lovely Lot (286), What He Saw (574), It’s Not Every Day (284), Two Out Of Three (386), I Did My Very Best To Die In The War (333), The Dancing Stopped in 1983 (349), Charity Shops on Saturday (548), The Photographer That No-One Else Can Get (594), White Chocolate Chocolate (318), Just A Figure Of Speech (640), Hold On (725), Would Chuck Chuck? (187), Don’t Talk To The Food (620), Some Shoes To Match (345), 1966 And All That (100), The Legends of Louisiana (107), Bill The Bag Man (726), The Quest For The Truth (215), Deadly Serious (360), I Always Did Hate Biology (380), Being Ernest (376), The Best Man (308), The Perfect Place (108), One Out Of Three (595), Stronger Than He Looks (421), Not Like They Used To (301), Thank You For The Joy (345), In His Shoes (974), Sabbatical From The Rat Race (630), and Parallel Bars (610). Total word count = 13,241. You can read the prompts which inspired this collection here. Jenny Worstall reviewed this collection on Amazon, giving it 5*: This inspired collection of stories is all the more remarkable as it was written as the author’s response to the “story a day” challenge. Some of the stories are linked, such as The Threadbare Girl parts 1 and 2 (these have also been published separately, such is the quality of this chilling tale), and A Military Couple part 1 which is very cleverly re-told in part 2 from another’s perspective. Morgen Bailey expresses volumes in a few words as she introduces us to unforgettable characters such as the delightful Phyllis in They Said It Couldn’t Be Done, young Bessie who mothers a lost boy in Into The Wild Blue Yonder, and Sonya struggling to choose between her diet and four chelsea buns in May The Fourth Be With You. The scope of the stories is far reaching in time and place. We have dinner with an alien in Alternate Reality and are left speculating uneasily about a forthcoming trip in The Big Game. As Amelia’s grandfather says in A Story For Amelia Earheart: “…you can go anywhere your imagination will take you.” I warmly recommend readers to look inside Morgen Bailey’s treasure box of stories; there are many fine diamonds and pearls to discover. How the Drabble came about (100 words), The Quarrymen (second-person story) (303), It’s Not You, It’s Me (279), R.I.P. Lenny ‘Shades’ Froug (544), The Thing and the Nameless Page (834), Sally never listened (588), Quiet and noisy (812), The last thing you think about (330), What cost a human life? (226), Death & Life (1,048), Dating Paradise (60), Making up the numbers (162), A win-win all round (310), The Ramshackle Writer (412), Beyond The Blue Horizon (a sci-fi story!) (770), Progress (409), Worth every penny (147), Bubble and squeak (169), Wreckage (432), Before Jessica (253), Leaving a gap (984), Human Unfriendly (295), It Wasn’t Me (831), Scratch, squeak, bark (140), All-inclusive package (558), His job depended on it (100), Eight a year (145), Billy No Mates (300), Talking when we could be walking (654), Petrified (1,250), and Plenty more fish (724). Total word count = 14,169. You can read the prompts which inspired this collection here. 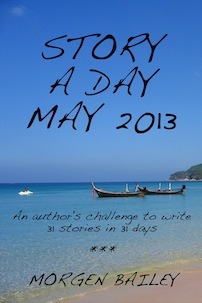 I’m currently doing Story A Day May 2014, details here.